It’s a new fabulous week, and as always here’s a little Marilyn for your Monday morning! Tis a little chilly this morning, so I think it’s time for a lovely hot drink to warm us up! What’s your favourite winter warmer? I do love a good herbal tea with peppermint one of my favourites, but I like to treat myself soy coffee every so often! Stay tuned for lots of fabulous vintage blogs this week! 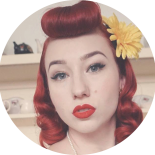 This entry was posted on June 27, 2016 by Miss Lady Lace in Marilyn mondays and tagged 1940's, 1950's, 2016, australia, blog, blogger, glamour, hollywood starlet, Lady Lace, marilny mondays, marilyn, marilyn monroe, miss lady lace, miss lady laces pinup blog, nicole, Norma Jean, perth, perth burlesque, perth pinup, perth pinup blog, perth pinup community, pin up, pinup, pinup blog, pinup blogger, pinup fashion, pinup girl, pinup life, pinup lifestyle, pinup perth, pinup queen, red lips, retro blog, retro girl, retro glamour, the perth pinup community, victory rolls, vintage, vintage blog, vintage blogger, vintage fashion, vintage girl, vintage glamour, vintage perth, vintage pinup blog.